As the child enters Primary School, the earlier stage of imitation develops into a need for applied learning with a guiding authority. The class teacher becomes the respected and readily accepted representative of the world. 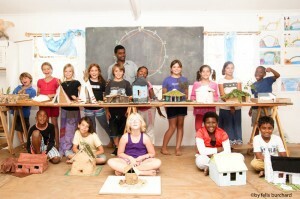 In Waldorf schools the class teacher moves with his or her class right through the Primary School. This is purposefully intended to develop a sense of security and to deepen the insight into the personality, development and progress of each child. The secure continuity also enhances learning. Throughout the years the class teacher and the parents create a co-operative relationship centred around the growing child. The curriculum steadily unfolds according to the developmental age of the child. Each lesson is planned to meet their emotional, physical and intellectual needs and to ensure that each child is lovingly guided through the thresholds of his or her development. The Waldorf approach to all subjects is vast and it enhances the creative and intellectual capacity of each learner. The curriculum is organized around a lively main lesson, which is the first lesson of the day and lasts approximately two hours. Main lessons concentrate on one subject for a period of three to four weeks, which allows for uninterrupted focus on a particular theme. For every main lesson subject, each learner creates a main lesson book, which is a carefully composed and illustrated compilation of the classroom experience. Main lessons include Mathematics, Geometry, Ancient Civilizations, Mythology, English Literature and later Biology, Science, Astronomy, Humanities and many more. The rest of the timetable follows a regular rhythmic pattern. Subjects like languages require constant repetition; others like mathematics, English literature and grammar appear both as regular periods and as main lessons. Specialised subjects such as the languages, technical skills, Eurythmy and sport are taught by specialist subject teachers. 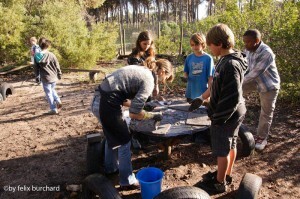 Practical experiences are also essential to the curriculum. Subjects such as handwork, woodwork and metalwork are taught to all pupils. In Waldorf education, subjects are not optional, but rather deeply comprehensive with both moral and intellectual aspects. Learners are inspired with each subject and steadily foster an attitude of wonder, reverence and gratitude which in turn leads to a joyous enthusiasm and affirmation of life. 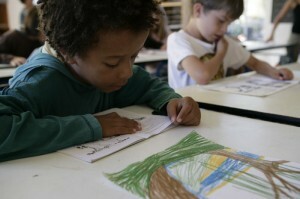 In Class 1 children are introduced to letters and numbers through stories and form drawing. The Waldorf approach ensures that the art of reading and writing is integrated with the whole being of the child. The developmental age of the child is considered by introducing writing first, due to it being a more concrete, practical and less demanding activity. By the end of Class 3 Waldorf children are reading and writing at the same level as mainstream children (read more on this subject under Parent Resources). 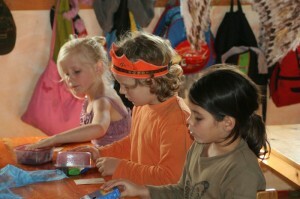 Learning in a Waldorf school is a non-competitive activity and therefore tests and examinations are not a primary focus. Academic skills in numeracy and literacy are developed throughout the primary school years through rhythmical practice, daily exercises and regular assessment by the teacher. The Class Teacher writes a detailed evaluation of the child at the end of each school year. In the upper primary and high school, learners complete weekly tests to assess their comprehension of each lesson and their progress. From Class 3 learners establish a routine for doing their homework – this intrinsically motivates the responsibility for completing it.